This 4 Ingredient Cilantro Lime Marinade is the perfect marinade to liven up chicken, beef, shrimp or other seafood. It’s simple enough to whip up a batch in literally a few minutes. It ONLY requires, extra virgin olive oil, cilantro, limes, and salt to taste. Really, the simplicity and freshness of this marinade makes it flavorful by itself or when paired with other complimentary spices or ingredients. Friends, I absolutely love this marinade and more than anything, it’s totally adaptable. 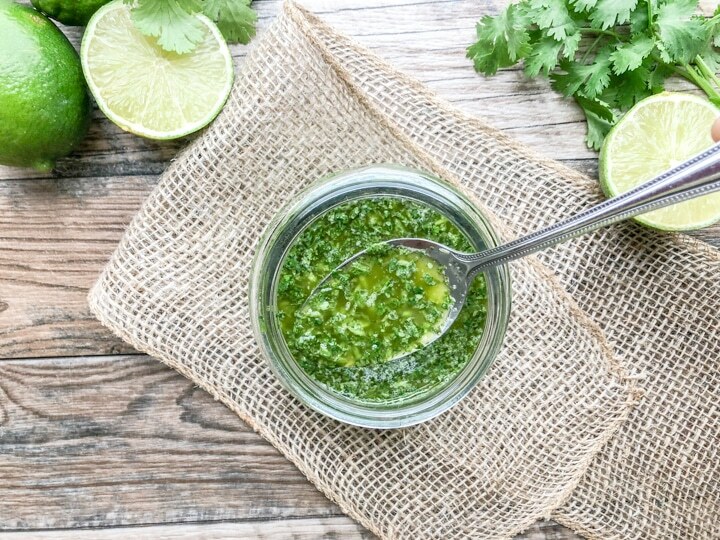 So, how would you adapt this 4 Ingredient Cilantro Lime Marinade? This is where your creativity and taste comes into play. 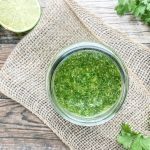 I would suggest you go into your pantry and simply add ingredients that would really compliment and enhance the flavor of this marinade – nothing too powerful though as you want to retain the fresh flavor of the cilantro and pure lime juice. Spices that come to mind would be cumin, coriandar, smoked paprika, fresh minced garlic, and for a little spice cayenne pepper flakes. These are bold flavored spices so a little goes a long way but would give this marinade a bit of a smoky flavor that’s great too. If you’re looking for a ‘somewhat’ Asian inspired marinade, you could add a few dashes of soy sauce and honey or maple syrup for a sweeter note. Another idea that comes to mind is adding other finely chopped herbs such as basil, oregano, thyme, rosemary, or other delicate herbs to the mix for a more herbaceous flavor. Although this marinade is easily adaptable, try to keep your additions to a minimum to make things easier on yourself. These days, at least for me, it’s about getting simple, flavorful and healthy meals on the table in a reasonable amount of time. Our schedules get really busy, so when I’m able to incorporate a simple but delicious marinade into the mix AND have dinner on the table quickly. I’m happy. Add all ingredients to a food processor, blender, or automatic chopper and blitz. Cilantro leaves should appear chunky after blitzing. What are some of your favorite marinades? This is a great one too Quick Asian Beef Marinade. I’d love to read your comments in the comment section below. If you love Pinterest or Instagram, I’d love for you to follow me. Always feel free to send me an email to: cree@cookingwithbliss.com. 4 Ingredient Cilantro Lime Marinade - A perfect seasonal marinade for chicken, beef, shrimp or other delicious tasting seafood. Wash cilantro and dry with a salad spinner, wrap in paper towel to dry (and/or pat dry). 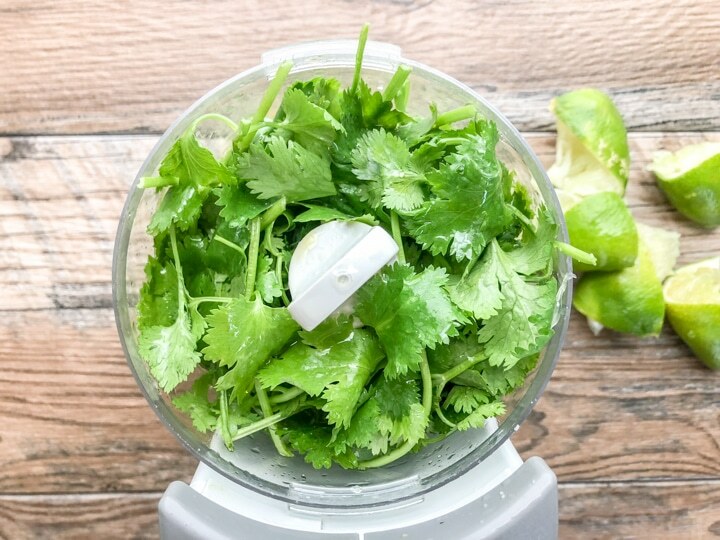 When cilantro leaves are dry, add cilantro, lime juice, extra virgin olive oil and salt to food processor, blender or automatic chopper. Blitz ingredients for a few seconds until cilantro leaves appear chunky. DO NOT OVER BLITZ. Marinate poultry, beef or seafood or use to dress vegetables. Use to marinade poultry, beef, seafood or to dress vegetables for added deliciousness. See post on ideas on how to adapt this recipe.